Whereas research in African oral literature has hitherto focused on individual languages and cultures, the author of the present study aims to develop a method to isolate recurrent narrative elements for inter-lingual and inter-cultural comparative research. Drawing on the methodologies developed by thematic, typological and motif research in the fields of folklore, cultural anthropology and literary studies, the author transfers them to Africanistics. Special emphasis is placed on the original linguistic manifestation of the texts which determines form and content of the transregionally important comparative units. The study is based on 32 selected folk tales passed on among the Kanuri in north-east Nigeria and the bordering lake Chad region featuring heroic characters like the enfant terrible and the witch hunter. Structural analysis of the stories yields linguistic elements and narrative motifs that are further defined and evaluated in the context of Kanuri oral literature and culture. In his conclusion, the author places his results in a broader West-African context that has been established in particular by French studies in African oral literature. He argues that this new methodology provides Africanists with the ability to conduct comparative research in oral literature. 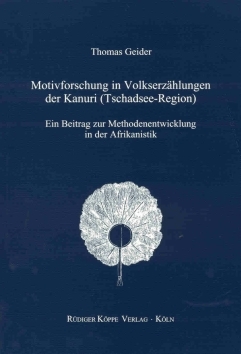 In seiner Habilitationsschrift legt Thomas Geider eine gelungene Verbindung von Motivforschung in der Kanuri-Erzählliteratur mit einer textvergleichenden Methode für die Afrikanistik vor. [...] Um der strukturellen Komplexität einer afrikanischen Erzählung gerecht zu werden, ist ein interdisziplinärer Ansatz nötig. Geider zeigt auf, welche Fächer zu einer fachübergreifenden Erstellung einer vielschichtigen afrikanistischen Analysemethode in Frage kommen, nämlich die Afrikanistik selbst, die Ethnologie, die Folkloristik und die Literaturwissenschaft. The dissertation [i.e. habilitation thesis, the publisher] by Thomas Geider is a real achievement, both as a documentary and as an original, well-informed and highly inspiring scientific work. Geider leistet mit seiner Studie einen sehr wichtigen Beitrag zur vergleichenden Erzählforschung in Afrika. Auch wenn seine Methode wegen ihrer Aufwendigkeit wohl nicht im größeren Stil praktikabel ist, so ist damit ein Modell geschaffen, an dem sich die weitere Forschung orientieren wird. Von großer Nützlichkeit für den überregionalen Vergleich ist auch der Appendix, der die Motive auflistet und mit Mot.-Nummern korreliert.